Are You Saying Yes.. 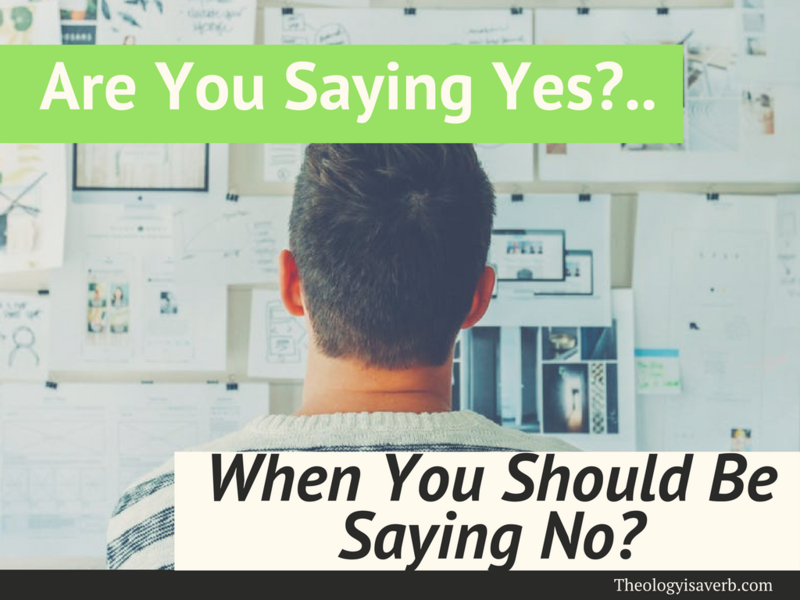 When You Should Be Saying No? Today, perhaps you find that you had much rather be saying yes to the many things that come your way than even contemplating the word no. Maybe, you do so out of a well intended desire to please others, or the thrill from successfully multitasking a multitude of tasks. And still, though your yes may result in a benefit for yourself, your family, friends, or community does not mean that it is still the answer that God may have intended for you to give. Discernment isn’t an add on when we find ourselves confused as to what path to take but it is essential in every choice we make. Even those opportunities which are in themselves good and promise to be fruitful. Take a moment to consider, if you will, whether you are inviting God into each of your decision making moments or just some of them. If not, why not? Ah, yes..that clever and insidious sin of pride. It creeps into even the smallest of places leaving us thinking foolishly that we are the only the only ones that can complete a task or the best one to do so. Thus, inevitably we must prayerfully discern why we feel that our yes is needed and be careful not to take on a project out of pride. But wait..you mean someone else might be called to take on a challenge, or be given gifts to fit the purpose? We are not being asked to do it all ourselves but in fact, are to call forth the gifts in our brothers and sisters to build up the body of Christ. Those around us do not always see their own gifts and releasing our own prideful motivation allows God to move others into action. It also permits each one of us to glimpse God actively at work as the best human resource manager and project manager for this world in which we live in. So, maybe we do not feel we are the best qualified, are already over committed or not really inclined to take on a task but do so because we would like to say yes to the person who has asked. This is not a good motivation either yet admittedly is an easy trap for the kind hearted Christian. In parish ministry we often find the same people being called upon time and time again. They want to be helpful and usually are, but offer a yes when honestly it should be a no. Then later, burned out and tasked beyond reason they leave serving because there simply is no more to give. Recognizing your own need to renew and refill is a valid and essential reason to say no. While initially difficult to do, as well as an adjustment for the one asking it may be the right answer. In making space for quality prayer time and detachment from the reaction or approval of others we can begin to see that God’s approval is the only one that matters. Is there a decision in my day today that I might not be needed to say yes to? Have I invited God into the task? Would others be better served by my no?